Born and bred in Minnesota, where he currently serves as the backup goaltender for the Wild, Stalock also serves as some very yummy eye candy. Originally drafted by the San Jose Sharks, Stalock played with them, and then the Toronto Maple Leafs before making his way back home. His face (when it’s not behind a cage) has a very earnest and open quality. Which seems like a strange thing to say about a face, but there it is. He’s especially handsome when he’s rocking his beard, though he is still all kinds of adorable clean shaven. Stalock looks like the kind of guy who gives excellent hugs. Also, I’m a sucker for men holding puppies who are also named Stalock. There’s only one thing that Eddie Lack might love more than hockey, and that’s tacos. Which I can totally get behind, because I’m of a similar mindset. But I might love Eddie Lack more than I love tacos … okay, maybe not because tacos are rad, but Eddie Lack is definitely up there. One of two Swedes on this list (Sweden produces an abundance of extremely talented, extremely attractive hockey players according to my very scientific research), Lack has been bounced around to a few different teams in recent years, and stuck around long enough for me to buy a shirt with his name on the back of it … which has a tendency to arrive the day after he’s been traded. Usually sporting a beard and a million watt smile, Lack seems to be at his happiest when he’s between the pipes. One could say that about any goalie, but the joy that Lack feels at playing the game is palpable. He’s earned the nickname “The Stork” due to his height and long legs, which definitely makes getting between them quite difficult. … The goalposts not his legs, oh my god. Personally speaking, I have a bit of a bias here. The Avalanche are my team, and all of their knifeshoe boys tend to skew toward being my favourites in some capacity. But Bernier? I thought he was a cutie before he wore the burgundy kit. Which … means nothing, I suppose. Bernier looks like your handsome, soft hipster boyfriend, with his stunning smile and sleeve of tattoos. On top of being an excellent addition to the Avs’ roster in terms of skill and by simply not being Semyon Varlamov (ugh), he’s also given people someone delightful to look at. He’s also a change of pace as a burnette, as the Avs seem to be filling some manner of secret Hot Blond Quota (looking at Landeskog, Wilson, and Rantenan specifically here). He’s had an outstanding season so far, really making a name for himself between the goalposts and on the roster. Fingers crossed that he one day makes the transition from superior backup goaltender to excellent starting goaltender. If Jonathan Bernier isn’t your idea of an attractive hipster, Braden Holtby just might be. The current starter for the Washington Capitals, Holtby has made a name for himself not only on the ice but within his community as well. Occasionally seen wearing ridiculous hats, Holtby has a beard that my boyfriend would kill for. When you picture Williamsburg Hipster, you’re basically picturing Braden Holtby, even if you’re not entirely aware of it. Affectionately referred to as “Holtbeast” by fans, Holtby is in fact a beast on the ice. And also kind of hairy. But like in a kind werewolf sort of way. In 2016 he received the Vezina Trophy (awarded to who is basically the best goaltender) after a 48-9-7 record and a .922 save percentage during the season. Though pundits seem to agree that he’s in a bit of a rut as of late, and that he’s going through a “reset” while the Caps’ backup takes on more of the net minding duties, Holtby is too great a goaltender to sit idle for long. If you know me personally, there was probably no doubt in your mind who my number one hot goalie would be. 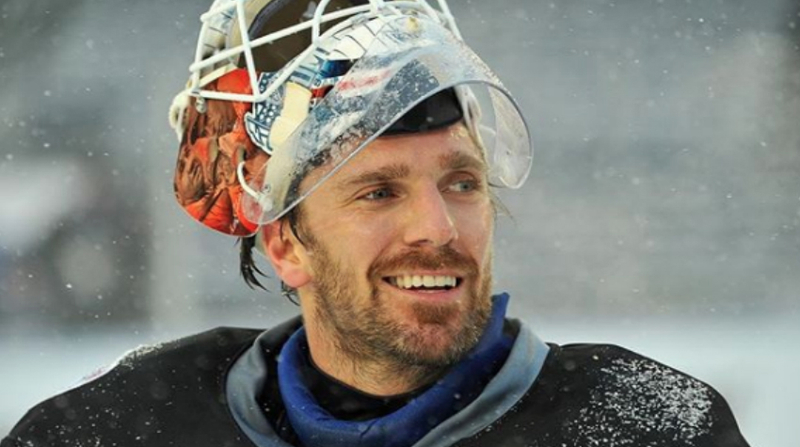 Lundqvist, who has played for the New York Rangers his entire NHL career, has made a name for himself as one of the league’s best goalies and one of the best dressed players off the ice (with PK Subban being first, of course). He’s also who your average layman will think of whenever you mention a “hot goalie,” if only because his face can be seen off-ice as well. If Hank ever hangs up his skates he’ll have no problem finding work as a model, considering he’s already done some work in that capacity. There are many reasons why fans call Henrik King Hank, or simply The King. While his on ice talents is undoubtedly one of them, it certainly wouldn’t come as a shock to me if it were because he looks like he could pass for some manner of Swedish royal. There is of course much more to these goaltenders than just how good they look. Playing professional hockey is extremely taxing, and requires a level of skill that few people possess. Few who make it to the NHL do so on anything other than talent. But, let’s face it, there’s nothing wrong with being good at both hockey and looking good while doing it.